Trump won the election, and now he has to deal with people actually paying attention to what he says and does (seems a bit late, but hey we're doing it now!). 9:43 a.m.: The @nytimes sent a letter to their subscribers apologizing for their BAD coverage of me. I wonder if it will change – doubt it? 11:03 a.m. The @nytimes states today that DJT believes “more countries should acquire nuclear weapons.” How dishonest are they. I never said this! 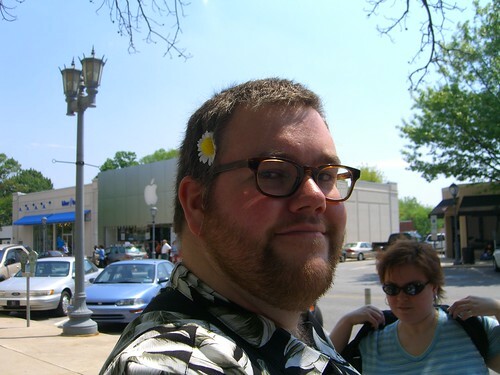 That's a picture of me 6 years ago (and many pounds heavier… sheesh. I think I'm fat now but I forget how much progress I have made!) at the Suburban Square Apple Store grand opening. How times have changed. Not only have I lost some weight, and look much more handsome, I also don't like going to the Apple Store any more. The fine folks over at Macworld asked me to explain why, and the result was this: Why I dread going to the Apple Store. Somehow I don't think this is going to be popular over at Macworld. I want that calendar on my Kindle! I am one of the biggest Amazon Kindle fans you'll find (heck, I wrote a book about the darned thing.. feel free to buy it for yourself and your friends) but Amazon might be going a little Kindle crazy... just a little. Have I told you lately that the political process in this country is broken (though it is great that I can post that opinion without fear that the government will track me down and haul me off somewhere unpleasant)? I'm watching the Democratic Debate on CNN at the moment and I am not pleased with what I hear. Dennis Kucinich is part of the debate, though no one really thinks he has a chance in hell to win the nomination. We all know this, but that doesn't excuse his fellow Democratic candidates from patronizing him. Now that's a zinger if I've ever heard one. What was Edwards' response? 'Cute, Denny,' he said with that bright smile of his and then went on not answering the question of whether he should be responsible, partly at least, for our troubles from China. It really turned my stomach because that phrase right there sums up the contempt the frontrunners have for anyone that says things we, the American people, know to be the simple truth. The truth ain't pretty, and as we all know it won't get you elected to be the next President. Now, I don't agree with everything Kucinich wants to do but I damn sure think that his candidacy deserves respect. He's working just as hard, if not harder, than Hillary, Obama, and Edwards. This story should be on the cover of US Weekly (maybe), not the fricking New York Times. I refuse to even link to the story itself. For some reason I knew that residents of Quebec are called Québécois, and yet I can never remember people's names, where my keys are, or important dates, let alone who I am going to see. 'Umm... hard to say. It wasn't that long ago,' I said deep in thought. It isn't comfortable and you end up dirty. Why do people do it? You know, sometimes people mock me for having too many computers (at the moment I have 4 computers in my one bedroom apartment). It is interesting to me that when they need technical help all that mocking goes away. I wonder where it goes? Soccer. I mean WTF, world? A long game that can end with a 0,0 tie?